Elijah Wood and his SpetreVision company is teaming up with Drafthouse Films, Rook Films and Timpson Films to produce the upcoming thriller The Greasy Strangler. Production is slated to begin this spring in Los Angeles, with casting to begin shortly. While Elijah Wood is on board to produce, it isn't ultimately clear yet if he will also star. Jim Hosking, who wrote and directed the "G is for Grandpa" segment of last year's horror anthology sequel ABCs of Death 2, will make his feature directorial debut, working from a script he co-wrote with Toby Harvard. The story is set in Los Angeles, following a man named Ronnie, who runs a Disco Walking Tour with his son Brayden. 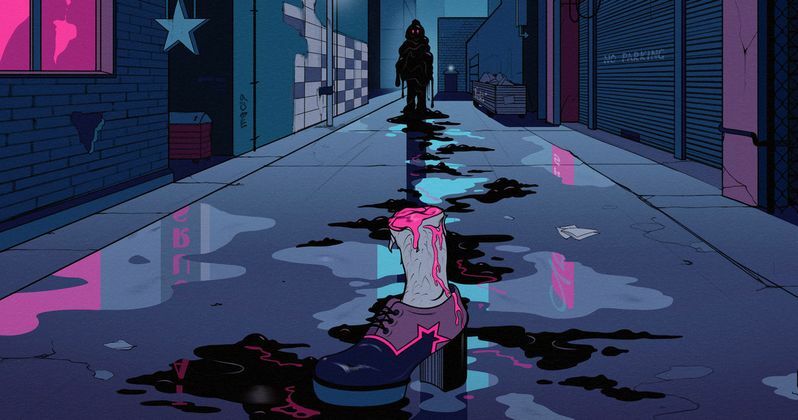 The father and son begin competing for the affections of an alluring woman who takes the tour, although her presence also signals the appearance of a killer known as The Greasy Strangler, described as an, "oily, slimy inhuman maniac" who stalks his innocent prey on the streets of L.A. Here's what Elijah Wood had to say about the project in a statement. "When Ant Timpson sent us Jim and Toby's script, we all agreed that it was the most disgusting, vile, and all-around grotesquely hilarious piece of cinema we'd ever read, with imagery we will likely never dislodge from our tender, greasy brains. And that is why it must exist!" Elijah Wood will produce alongside his SpectreVision partners Daniel Noah and Josh C. Waller, Rook Films' Andrew Starke and Timpson Films' Ant Timpson. Ben Wheatley (A Field in England, Sightseers) is executive producing with Drafthouse Films' Tim League. Take a look at the first teaser poster below for The Greasy Strangler, and stay tuned for more details on the production.